Differentiating should be considered a key element to your brand strategy and help to provide an opportunity and vision to define a niche within your market sector, helping to gain the attention of your existing customers and extend your proposition to encourage new markets and audiences. From creating your organisational health check – this should now provide you with a wider picture of the landscape your organisation is positioned, its strengths and weaknesses, the competitor landscape and the potential opportunity to create a model of differentiation from the competition in order to meet your organisations objectives. 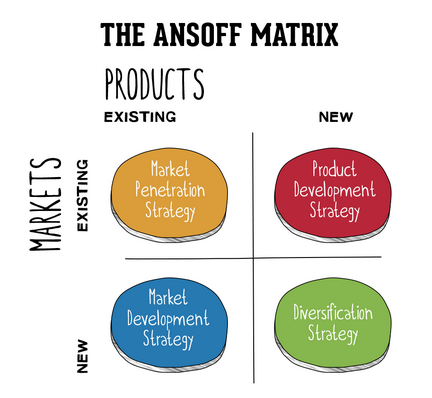 Applying the Ansoff (1957) strategic marketing grid provides a canvass to understand how the internet can offer four directions to a product or service. Market Penetration: Is there an opportunity that exists to sell more products to your existing customer base? Market Development: Has the research identified new markets to enter that your competitors have not even considered? Product and Development: Are there cheaper, more effective ways to work with alternative manufacturers, suppliers or a different approach to servicing your customer base? Diversification: Could you move into a new market and capitalise on first mover advantage with a new product or service offer? 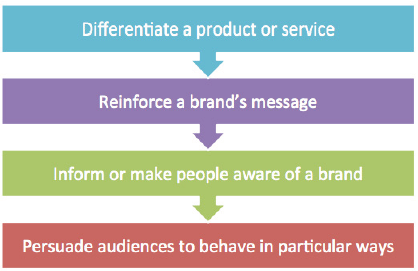 Brands can use the tactic of marketing communications to help differentiate their brand against competing brands and to further support the use of such communications methods, the DRIP framework has been introduced with the purpose to aid brand differentiation. A useful framework to consider if operating in a market where there is little to separate competing brands. DRIP refers to Differentiate, Reinforce, Inform and Persuade. 2. Reinforce: From identifying the points of difference, how could the brand reinforce these areas within the brand communications and further enhance this as a unique selling point? 3. Inform: From reinforcing the brands point of difference, begin to consider what digital communications tactics to implement to help drive awareness and interest within the market. 4. Persuade: Incentivise or encourage your audience to engage with your new product/service or digital brand proposition. Following the blue ocean framework suggests Brands need to focus on creating an untapped market space where competition is irrelevant and as unexplored. 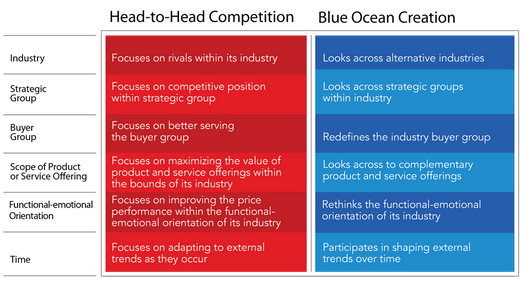 Blue Ocean theory suggests that a majority of brands are all competing in the same market space, otherwise known as the red ocean (head to head competition) where the need to differentiate is required (i.e. creating a blue ocean) as defined in the table below. A recipe for success is the need to find your point of difference, a unique selling point (USP) and all three frameworks provide a canvass to begin to understand and articulate this opportunity. Awesome post for newbies to know the sense of marketing and their core values to adopt for the brand empowerment with digital marketing and its other essentials to know for further progression. Also these tips play an important part in brand transformation, once you hit the targeted market you will certainly get high amongst Google ranking. Many thanks John and thanks for taking the time to reply – Yes, agree on the transformation side, it’s essential to have a point of difference in crowded market places.